Over the New Year period 0-day exploits have been rampaging around. In our threat control lab we have looked into hits for the recently discovered 0-day that exploits a vulnerability (CVE-2013-0422) in the latest version of JAVA (1.7 update 10). Our records imply that an exploit, from cool exploit kit, has been on the hunt from January 8th this year, if not before. Example file names seen so far are 2233.jar, 2332.jar and some randomised ones, downloaded from different domains that serve the exploit and other malware. The 0-day under discussion, on successful execution on a victim’s machine, exploits the vulnerability in the java environment and downloads a Windows executable file, which currently happens to be a Ransomware Trojan in most of the occurrences. Fortunately, K7 users are pro-actively shielded from this 0-day attack by the Carnivore technology embedded in K7 security products. 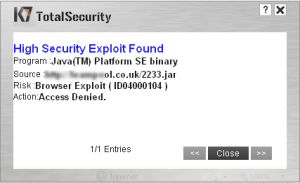 Here is a screenshot that depicts K7 security products blocking an attempt to exploit the vulnerability.